Have you heard?! 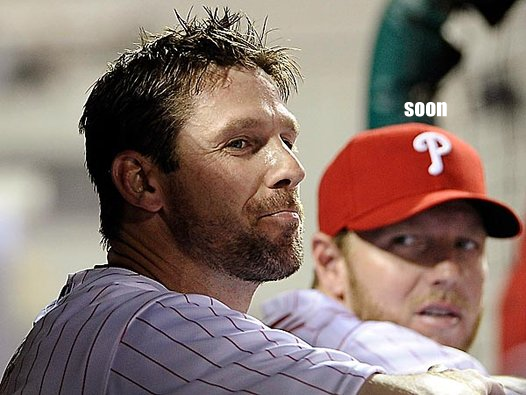 Roy Halladay has struggled mightily this season. There's no way around it, and I’ll admit that to call it “struggling” thus far may be sugar coating it a little. Everyone--literally every writer on this website--has written their “What’s Wrong With Roy Halladay?” article. And they’re seeing the same things as you. His velocity is down, his cutter doesn’t cut, he's having trouble finding the strike zone (which never happened before), he's showing signs of frustration on the mound, and he turns a shade of purple while dripping sweat on a 70 degree April night. Yeah, well I don't understand why zero reporters, team staffers, talking heads or fans can seem to get to the bottom of Doc's ruddy, blustered and sweaty condition of late. There's lots of talk about it, no addressing of it. Wtf? At the very least, it's a curious development and now made more relevant with his copious number of abyssmal starts. Oh.. If looks could kill, Cliff would be in baseball Heaven alongside Harry, Ty, and the Babe. He needs a good doctor to do a complete work up. Somethings not right when a 35 yo man sweats buckets and looks like he can't breathe with minimal exertion.